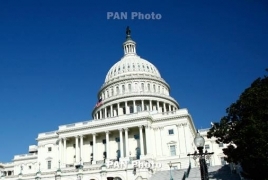 PanARMENIAN.Net - The U.S. Senate failed on Thursday, June 11, to advance legislation to strengthen protections against cyber attacks, as Democrats banded together to oppose the measure's inclusion in a defense policy bill President Barack Obama has threatened to veto, Reuters reports. By a 56-40 vote, lawmakers decided largely along party lines not to move ahead with the measure as an amendment to the National Defense Authorization Act. The vote came after the government announced late last week that hackers, possibly linked to China, had stolen millions of federal employees' records from its computers. It was the third time in three years that the Senate has failed to advance bipartisan cyber security legislation. However, the bill to extend liability protection for companies that share information about cyber attacks might not be dead, Reuters says. A spokesman for Republican Senate Majority Leader, Mitch McConnell, said he had not announced how he would proceed. A spokesman for Harry Reid, the Senate Democratic leader, said the measure would likely pass quickly if McConnell brought it to the floor under regular order. Republicans, the majority party in both the Senate and House of Representatives, had said they sought to include the cyber security measure in the defense bill to move it quickly. But Democrats accused them of seeking to make it more difficult for Obama to carry out his veto threat, saying the cyber security measure would have passed easily if McConnell brought it up as a standalone bill. The House passed its version of the bill by 355 to 63 in April, with strong support from both parties. It passed the Senate Intelligence Committee 14-1. Obama has threatened to veto the defense bill for reasons including the use of a special war fund to exempt the Department of Defense from mandatory spending caps. His fellow Democrats in Congress also object to that budget plan.